Don’t see a wildfire on the list? 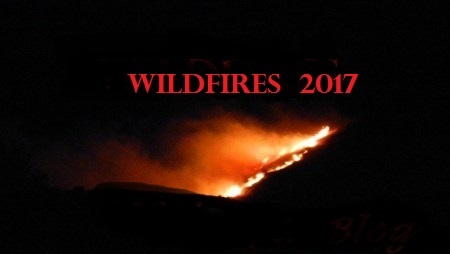 Visit on Twitter @nwfireblog & DM us or go to our Facebook Page & let us know! SW Area Forestry. AK DOF. 9 miles SW of Ophir. Short grass and hardwood litter. 4.5 miles N of Sterling Highway and burning in the Kenai National Wildlife Refuge, on the Kenai Peninsula. Started 6/15/2017 @ 1830 hours. Lightning caused. Spruce and hardwood fire fuels. Galena Zone. 45 miles SW of Galena. SW Area Forestry. AK DOF. 28 miles NE of Shageluk. Short grass and hardwood litter. Galena Zone. 11 miles S of Shunghak. Timber and brush. Fairbanks Area Forest. AK DOF. 22 miles NE Big Delta. Timber. Mat-Su Area Forestry. AK DOF. 55 miles NW Talkeetna. Short grass and brush. 7 miles NW of Flagstaff. NE Side of Kendrick Mtn. Coconino / Kaibab NF. Started 6/1/2017. Lightning caused. SE Patagonia. Started 6/14/2017 @ 1200 hours. Moderate fire behavior with backing, creeping and smoldering. San Carlos Agency. Bureau Indian Agency (BIA) + San Carlos Apache Tribe. 50 miles E – NE of San Carlos. Near Freeze Mountain. Lightning caused. N side of Mt. Graham. Coronado NF. Started 6/7/2017. Lightning caused. Tonto NF. Started 6/10 @ 12 am. Cause under investigation. Type 1 IMT. Coronado NF. 2 miles SE of Dragoon. Started 6/7/2017 @ 1530. Lightning caused. Coronado NF. Douglas Ranger District. 6/7/2017 start date. Lightning caused. Apache-Sitgreaves NF. 16 miles W of Heber. 3,241 acres. Anderson Fire | Resources dispatched 2041. Located Cherokee Road in Mescal. Griffith Fire | Dispatch time: 1536. Located at I-40 and MP 34. 0.4 acres. Hughes Fire | Dispatched at 1503 Located at SR 87 and MM 199. Lapham Fire | Resources dispatched at 1446 hours. Located at Hwy 71 @ MP 86 in Augila. 2.1 acres. Lowell Fire | Dispatched @ 1358 hours. Located on Clark Road in Flagstaff. 1 acre. R-14 Fire | Resources dispatched @ 1332 hours. Located on Hwy 73 and MP 324 on the Apache Reservation on White Mountain. Hackamore Fire | Dispatched @ 1205 hours. Located on Hwy 88 and Apache Trail. 0.25 acres. Hillside Peak Fire | Dispatch time @ 1147 hours. Hillside. 25 acres. 5-2 Engine 561 dispatched. Falcon Fire | Dispatched at 0756 hours. On Hwy 79 ad MM93. Papago Fire | Dispatch time @ 0723 hours. I-9, MM 54.5, KM 87.6. Topeka Fire | Dispatched @ 1535 hours. I-40 MM34. 0.25 acres. Fire under control. Reef Fire | Resources dispatched @ 1454 hours. Hwy 87, MM 202. 0.1 acres. SHOW LOW DISPATCH CENTER NEW! Krook Fire | Dispatched @ 1453 hours. Krook Campfire Site #1. 0.1 acres. R-14 Fire | Dispatched @ 1324 hours. 500 acres. Pinyon and grass. Resources dispatched: D-1-7, E5241, E5262, E5264 and E5267. Spring Fire | Dispatched @ 0857 hours. Located at Woods Cyn Lake. Logging, slash and pine. 0.25 acres. Sequoia National Park. 1/2 mile S of Amphitheatre Point. Car fire spread upslope. Grass fire fuels. 100% contained. Tulare County. Off of Hotsprings Rd W x Community of California Hot Springs. 135 acres. 70% contained. Started @ 6/13/2017 @ 1700 acres. Hansen Avenue X Nuevo Road in Nuevo (Riverside County). Brush fire. ANGELES EMERGENCY COMMUNICATIONS CENTER NEW! Bear Fire | Dispatched @ 1354 hours. 16321 Placentia Canyon Rd. Resources dispatched: SO 37, RD 14, P5K2, AR-0501, BC 32 (@1445). Jardine Fire | Mutual Aid request. Dispatched @ 1635 hours. Range 800, Case Springs Lake. Resources deployed: Palomar HS, CANSO Crew 2, Div2, E21, E25, E320, E326, E37, H301, H538, PV 24. Mountain Fire | Mutual Aid request. Dispatched @ 1453 hours. Grand Avenue and Macy Street. FEDERAL INTERAGENCY COMM CENTER NEW! Mustang Fire | Dispatched @ 1820 hours. NB I-5 @ Oak Hill. Resource deployed: P5K 2A6. Deercrest Fier | Dispatch time @ 1646 hours. 1015 Deercrest Drive in Devor. PNK2, AZ1502 dispatched. Bear Spring Fire | Dispatched @ 1539. Located on Bear Spring Rd and Strawberry Peak off of Lookout Road. Hwy 168 / 180 Fire | Dispatched @ 1823 hours. No fire details. Snyder Fire | Dispatched @ 1613 to 5868 Double Eagle Rd. No fire details. YREKA INTERAGENCY COMM CENTER NEW! Bigflat Fire | Dispatched @ 1602 hours. .1 acre. LOS PADRES NATL FOREST NEW! Shore Fire | Dispatched @ 1551 hours to 70202 Jolon Road. Resources assigned BC12, LPF Crew3, LPF E15 4×4 and E16 4×4. REDDING INTERAGENCY INTERAGENCY COMM CENTER NEW! Thirty One Fire | Dispatched @ 1324 hours to Wyeott. ASH MTN DISPATCH CENTER NEW! Amphitheatre Fire | Dispatched @ 1315 hours (Resource E72). Grass and brush. 0.1 acres. 10 miles N of Rangely. Under in same Fire command as the HUNTER FIRE. CRAIG INTERAGENCY DISPATCH CENTER NEW! Confluence Fire | Dispatched @ 1555 hours. Kremmling Wood Plant. Dispatched resources: CO-GYRX-108. 4 acres. FT. COLLINS INTERAGENCY DISPATCH CENTER NEW! Magnolia Fire | W Magnolia Hill. Dispatched @ 1334 hours. 0.1 acres. Tapper Creek Fire | Dispatched @ 0938 hours. Dave Wood Rd and 1/10 mile on V60 Rd. 0.1 acres. PUEBLO INTERAGENCY DISPATCH CENTER NEW! Hwy 160 Fire | Rio Grande County, near South Fork. Dispatched @ 1335 hours. Out at 1340 hours. 0.10 acres. Human caused. Buck Gulch Fire | Jefferson County on South Platte Road in Buck Gulch. Abandoned campfire with log outside of fire. Dispatched @ 1242 hours. Contained/control/out at 1353 hours. N of El Rito Ranger District. 9 miles N of Canon Plaza and 16 miles NE of Canjilon. Carson NF. Started 6/3/2017. Started @ 1900 hours on 6/14/2017. 2.5 miles W of FR150. Ruby Ole area. Bennett Lane. Sierra Los Pinos NF. Cox Ranch. Valles Cadera area. USFS. Cause unknown. Gila NF. Bear / Whitewater. Snow Lake area FR 119, FR 28 and FR 1535. Burning in Baldy fire scars. Started 6/9/2017. Lincoln NF. Burning on ridge of Sacramento Mountains on Sacramento Ranger District. 8 miles SW of Weed and 4 miles NE of Timberon. Burning in remote location. Lightning caused. *** Previously reported fires. No updated info. Sources: Fire Agencies, CADs, Social Media.